Update widgets without closing any copies you have open. Is there a better alternative to Smart Widget Installer? Is Smart Widget Installer really the best app in Puzzle category? Will Smart Widget Installer work good on macOS 10.13.4? Smart Widget Installer... Tired of Dashboard closing your open widgets whenever you install a new version of widget? Smart Widget Installer is the answer. Smart Widget Installer needs a rating. Be the first to rate this app and get the discussion started! Just drop any number of widgets on the app to install them. If the widget is not installed it will install normally. 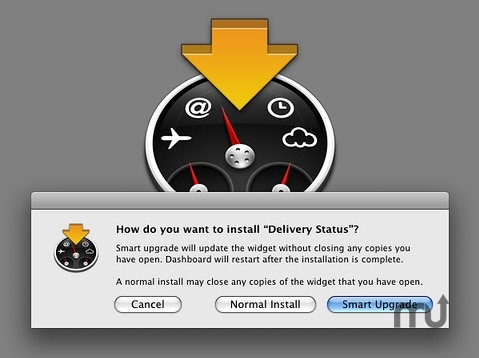 If it is already installed, you get the smart upgrade option, which will update the widget without closing any copies you already have open. This works with any widget, though it is particularly useful with Delivery Status. If you're tired of having to move your widgets back in place every time you update them, this app is for you. Unfortunately Safari ignores this setting if you have it set to automatically open downloaded files. If you get the standard installation screen but want to do a smart update, you can just click cancel and then double-click the widget in your downloads folder. Select All and Copy are now available, which should make it easier to report errors, if necessary!